Over a year ago Apprising Ministries began warning you that Word Faith Heretics Like Creflo Dollar Draw Nearer To Evangelical Acceptance. I’m sure many thought, “Silva, you’ve lost what’s left of your mind.” But since then we’ve had the Elephant Room 2 try and tell us that T.D. Jakes Is Not A Word Faith Prosperity Preacher. It seems the inmates are running the evangelical asylum now as postmodernism’s influence wraps itself around the sappy sentimentality produced by corrupt Contemplative Spirituality/Mysticism and slithers its syncretism deeper into the weak heart of the mainstream of the church visible. I wish I had better news; but, I don’t. If you didn’t know, Mark Chironna and “Bishop” Clarence McClendon are typical TBN Word Faith (WF) heretical snake oil salesmen along the order of Paul Crouch himself. While Jeremiah doesn’t appear with them, he was the first featured speaker during this time TBN uses as a main vehicle to fleece their flock each year. Rather odd that David Jeremiah, an ostensibly conservative evangelical, would wish to rub shoulders with WF prosperity preachers. Yet here he is below where you’ll see Jeremiah lavish his praise upon Paul Crouch as well as TBN itself. In this first clip Crouch touches upon the classic sow a seed (money) so God is obligated to bless you. 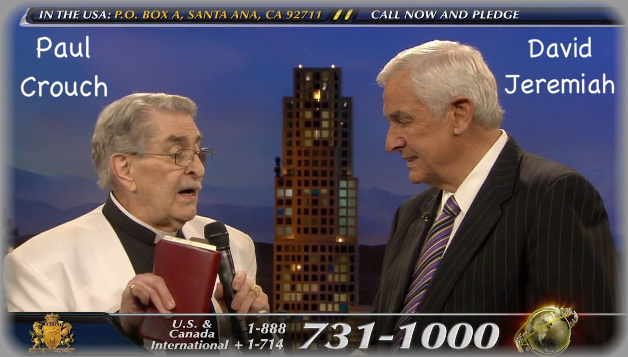 In this next clip Paul Crouch is telling the faithful they should support TBN because of it’s continued expansion with new networks, which he says he can’t even name because there are so many. Crouch informs us that God is behind their having to continue to grow and introduces David Jeremiah, who discloses an interesting tidbit. Considering where he is, David Jeremiah appears to be trying to straddle the fence in his Praise-A-Thon sermon at TBN. It seems, at best, an attempt to blur the lines between orthodoxy and and heretical WF teaching. You’ll see Jeremiah expressing praise for Paul Crouch below so his discernment certainly leaves much too be desired. So He gives us more to manage. And, as long as we manage what He gives us effectively, God can trust us with even more resources. What Jeremiah has just said would be true of the fictitious WF god, who is at the beck and call of mankind; but the one true and living God of the Bible is completely sovereign. He already knows before He gives us anything what we’ll do with it; and the LORD God almighty already knows that He can’t trust any of us—period. Right on the line between WF and orthodoxy he tells us, “God says, whatever we invest, that’s what we get back,” which is a principle Jeremiah assures us works “across the whole link and breadth of life.” Using the desire to be loved as an example, he tells us that if we want to be loved by more people, we need to invest love in more people. If you wanna get blessed by TBN, then the problem you have to solve is, “how am I investing in TBN?” Let me tell you something, we have this incredible network today because people before us—for many, many years before us—have invested their dollars, their time, their effort, in this network so that it could be what it is today. So, I wanna stop right now and ask you to do this; if you’ve been blessed by TBN this year—and you haven’t called to say, “I wanna be a part of TBN going forward”—I want you to go to your phone and find out how you can help make this network even more successful than ever before. If you don’t call, if you don’t go to the phone, if you don’t help, then this ministry can go no further than the people who join with it, and become part of the team… I want you to go do it [call to pledge money]; because it depends upon all of us together. “What is the principle of increase?” Watch. [reviews his principles] You only get what you sow; you get later than you sow; and you get more than you sow, amen?… The Bible says that God works, in His plan for us, men and women, by the principle of sowing and reaping. Let me tell you something that’s real special about what we do here at TBN… Do you know the Bible said that God believed in this principle [sowing and reaping]; did you know that?… Did you know that God believes in the sowing principle? How does He believe in it? So tonight, I wanna encourage you, with all of my heart, to understand your part in the ministry of TBN… Everybody needs to do it [send money], and especially now… It’s really encouraging to hear Paul talk about how God has sustained [TBN], and it hasn’t gone backwards. But unless everybody who’s involved in this ministry gets underneath it and says, “This is part of my life”—I mean, if you sit and watch this program [Praise The Lord] at home—if you use this to grow spiritually, then the Bible says you should be involved with it. You should invest in it. You should make it part of what you do for almighty God. We can do this together. These 14 networks aren’t gonna just keep going because we started them. They’re gonna keep going because we have a part in financing them and working to make them happen. So tonight I wanna ask you, help us do this. Help Paul do this. I’m so amazed at the vision God has given to this man… I want to be a part of helping him continue… I hope you will do that, too. Be a part of what’s happening at TBN. And let’s pray together that God will enable you to do more than you even thought… [A]fter you support the [local] church, you need to support the ministries that feed your soul [like TBN].